If you need cash now, but want to keep complete ownership of your royalties; this option is for you. We can advance you cash once we receive a temporary assignment of your future payments. NO prepayment penalty or hidden fees. If you are looking to get more money than a cash advance can provide, consider selling your royalties. 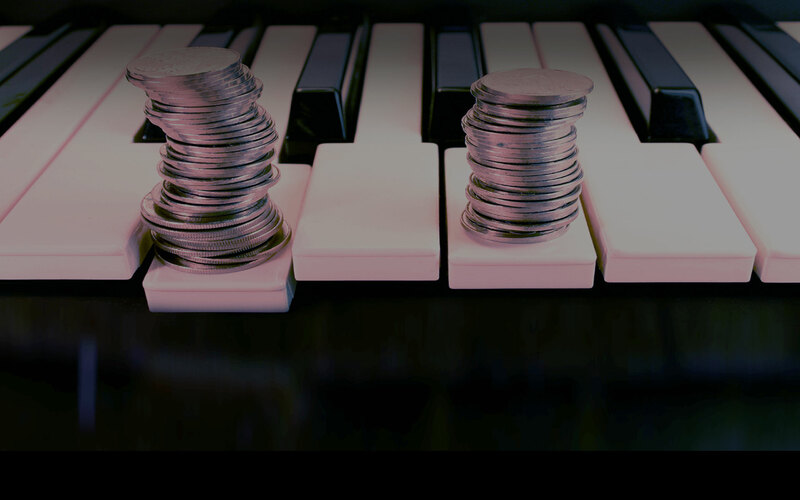 Our associates can purchase your music royalties for a large, up-front cash payment. NO more worrying about declining or fluctuating royalty payments. To find out how much cash you can receive, please submit the online application. A representative will call you within one business day of receiving your information. Since our birth in 1988, we’ve funded hundreds of established music royalty earners including producers, artists, songwriters, composers, publishers, record labels, and their successors. Our tremendous growth to hundreds of clients is driven from our core belief you should not have to wait months to get your royalty checks. During the last thirty plus years, we have always striven to build a relationship with each client and to provide fast and flexible service that banks could only dream of offering. It is no wonder that our clientele have included both rising stars and some of the world’s most famous names. MICHAEL JACKSON, one of our true musical heroes, even honored us by making us his private lender of choice. Mr. Jackson owns other music catalogs of lesser value, and has used those to borrow, as well. In 2001, for instance, he used one such catalog to borrow from Royalty Advance Funding, a Beverly Hills company. The collateral was his music catalog, which contains hit songs such as “Billie Jean” and “Beat It,” as well as songs Jackson purchased some time ago written by Sly Stone including classics such as “Everyday People,” “Family Affair” and others…. IS ROYALTY ADVANCE FUNDING DIFFERENT FROM A BANK? We are very different than a bank — we provide much more flexibility, understanding, speed, and personalized service. We have minimal credit requirements, ask only for basic information, and strive to get you your money fast. We are a lender under the California Finance Lender Law with license #6031712. Funding is normally fast and easy — cash advances can take as little as one week or less, depending on the circumstances. Everyone is welcome to apply regardless of your credit history. We have funded many royalty earners with low or even no credit. DOES MY EXISTING ADVANCE HAVE TO BE COMPLETELY PAID OFF BEFORE I CAN GET ANOTHER ADVANCE? You can request more advances at any time depending on your income. We also can work with existing lenders. WHAT IF I WANT MORE CASH THAN I CAN GET FROM AN ADVANCE? You can sell your royalties for a large, lump-sum payment. To “Cash out”, please contact us to find out how. CAN I GET A REFERRAL FEE? We love to pay referral fees, so call us for details. DO YOU ONLY WORK WITH MUSIC ROYALTY EARNERS? We can provide funding to recipients of almost any type of royalty stream or payments — such as book royalties, oil royalties, sports royalties, and lottery winnings. RAF has consistently provided financial support. They offer an absolutely invaluable service. RAF helps writers even out their royalty streams. Dependable in business, and a true friend. I could not give enough thanks for all they have done. Son of legendary Motown artist Marvin Gaye Jr., writer of numerous hit songs. The kindest people I have ever done business with. Thank you so much for always being there for me. Service was fast,courteous. I highly recommend.